This is a pic of the Amitabha Tower that my friend designed and built at his temple in Quy Nhon City after he had a prophetic dream. Amitabha Buddha is the central focus of worship in Vietnamese Mahayana Buddhism. 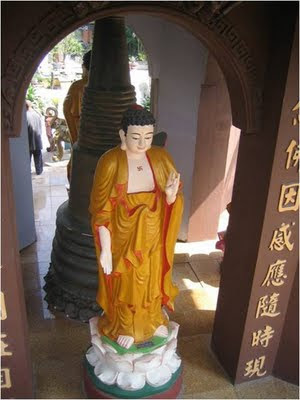 The worship of Amitabha is a characteristic of the Pure Land School of Buddhism, though in reality it is very rare for any particular school to be practiced exclusively in Vietnam. Most teach a combination of various schools, which is the prevalent mode throughout East Asia, including in Korea, Hong Kong, Taiwan and China.